Today we are introducing a new Xbox 360 bundle that will be available for a limited time, while supplies last, at select major US retail stores this spring. 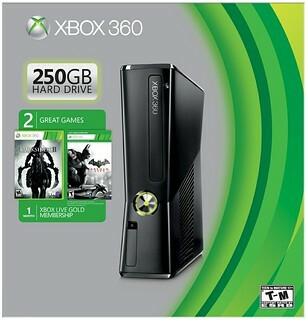 The Xbox 360 250GB Spring Value Bundle includes: Xbox 360 250 GB, wireless controller and a copy of “Darksiders II” and “Batman: Arkham City,” (via download) token and one month free of Xbox LIVE Gold for $299 USD (ERP). The Xbox 360 250GB Spring Value Bundle is shipping today in the U.S.